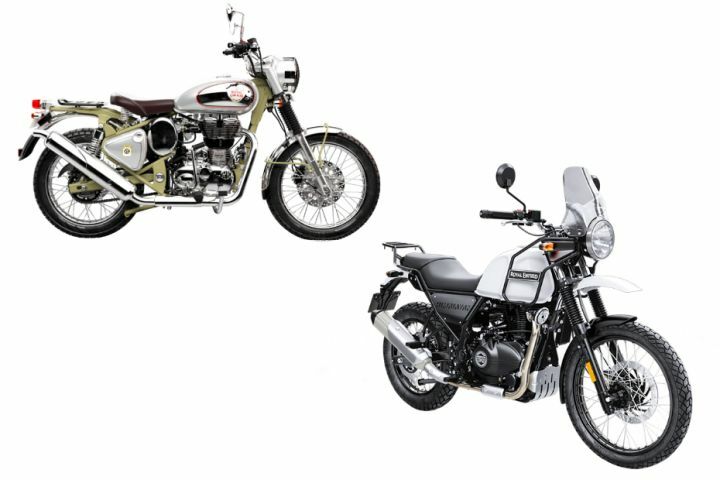 With the launch of the new Bullet Trials motorcycles, Royal Enfield has two different off-roaders in their lineup. On one end, you have these new scramblers and on the other, the Himalayan. The question now begs to be asked as to why Enfield needed to have both of them on sale. For the sake of this piece, we shall be focusing on the Trials 500 as that offers performance levels closer to the Himalayan. While the two motorcycles are set up to venture off tarmac, it is the Himalayan that looks purpose-built for it. Minimal and spartan styling complements well with the ruggedness that it seeks to impose. Plus that windscreen, raised fenders and provisions for mounting peripherals makes it all the more adept at tackling off-road journeys. To complete the look, you get a proper 21/17-inch spoke rim setup shod with knobbies. It might be called the Bullet Trials 500, but the styling is more in tune with the Classic 500. The round bulbous tank, oval side panels and oodles of chrome are all reminiscent of the Classic series. Even the sprung seat is from the Classic. You do get knobbies here as well but they come fitted onto 19-/18-inch spoke wheels. The thumpers are all about torque. With a sizeable advantage over the Himalayan, the Trials 500 should have the edge here when it comes to tackling the nasty bits off road. For years and years, Bulleteers have used the Bullet and the Classic, with slight mods, to conquer the Himalayas. The Trials is sort of a factory custom and should do you no harm in handling rough mountain roads. However, if you are looking to attempt something nastier, something that is even off the beaten path in the mountains, we would definitely like to have the Himalayan as our partner. Its tight packaging, along with all the right numbers (namely ground clearance and suspension travel) make it a very delightful off-roader. The Himalayan’s purpose was clear right from the start - be a capable off-roader. While many motorcycling giants (Kawasaki and BMW Motorrad) have taken a swipe at making something better than the Himalayan, they’ve struggled in matching the Himalayan’s ability-per-rupee proposition. Sure it has had its problems, but the new BSIV Fi version is absolutely brilliant. And it is priced considerably lower than the Trials 500. Rs 20,000 lower. Where does the Trials fit in then? Well it is sort of the hipster scrambler. It will instantly draw attention in the city, not the least because it looks different from the Classic. And of course, we have no doubt that it could make short work of some light off-road trails.